Hey, friends! Happy Monday! It’s so great to be home after a whirlwind weekend in Los Angeles and San Diego for Pinners Conference. Two classes, nine cakes, nine batches of frosting, a lot of clean up and six hours in the car with my mom and brother pretty much sums up my time there. It was quick but it was fun and I loved meeting so many of you! One of the classes I teach at Pinners Conference is Cake Basics 101. In this class I demonstrate how to make and decorate my Classic Yellow Cake with Chocolate Buttercream. I love using this cake to demo because it’s a great cake for any beginner baker to make. There’s only two elements to it: cake and frosting. Easy peasy! Well, there’s actually several cakes I’d recommend for beginner bakers, but I usually tell people to first look through my cakes and just choose a cake that sounds good to them. No matter how many elements are in a cake, if it’s something you’re excited about, I don’t think you’ll mind the time it takes to create it. And you certainly won’t mind eating it after all that hard work! 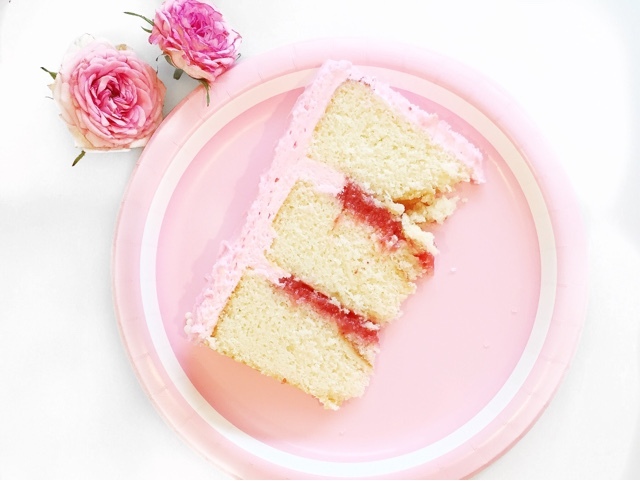 However, if the idea of cake layers and frosting, along with a couple different fillings and drip are the reason you’re not making a cake, let’s simplify it so you feel confident heading into the kitchen! Below I’ve put together a list of what I think of the best cakes to bake if you’re just getting started making cakes. First up, my Yellow Cake with Chocolate Buttercream. 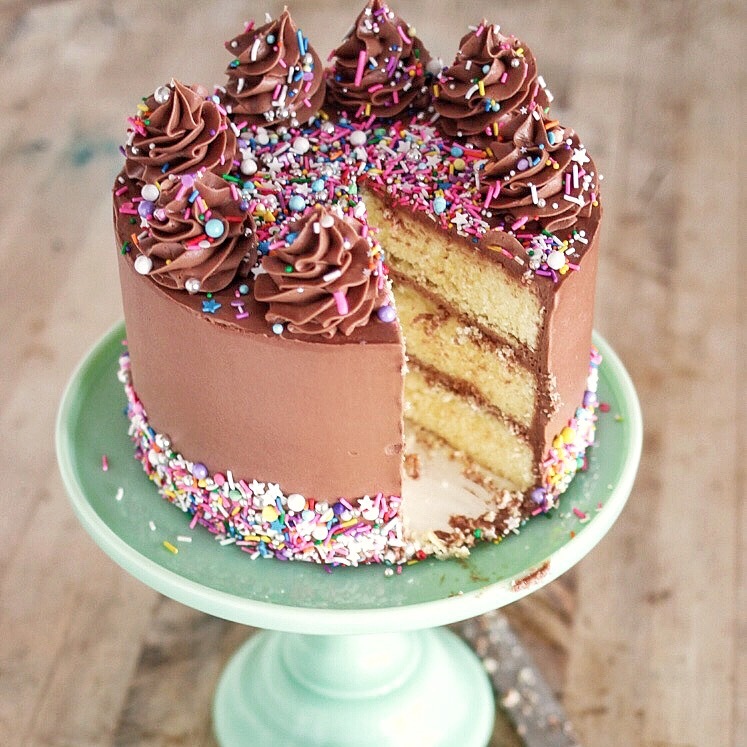 Like I said above, this cake is great for beginners because there are only two parts to it – cake and frosting. The cake itself is pretty fool proof and the frosting goes on as smooth as butter. I love to doll it up with Sweetapolita sprinkles. Another easy cake to start with is this Classic White Cake with Vanilla Buttercream. This cake is a great base to any frosting, and pairs well with so many different fillings. I often throw in fresh strawberries or strawberry preserves between the layers. Another similar white cake with vanilla frosting is my Funfetti Cake. My Biscoff Cake has a couple more elements to it that the previous two mentioned cakes, but, it’s a simple one to make and the flavor is worth every minute of kitchen time. I also like this one for beginners because it’s a total crowd pleaser! You’ll serve this cake and I guarantee people will never believe it’s the first layered cake you’ve ever made. Similar to the Biscoff Cake, the Churro Cake is always a huge hit and not too hard for a first-time baker. 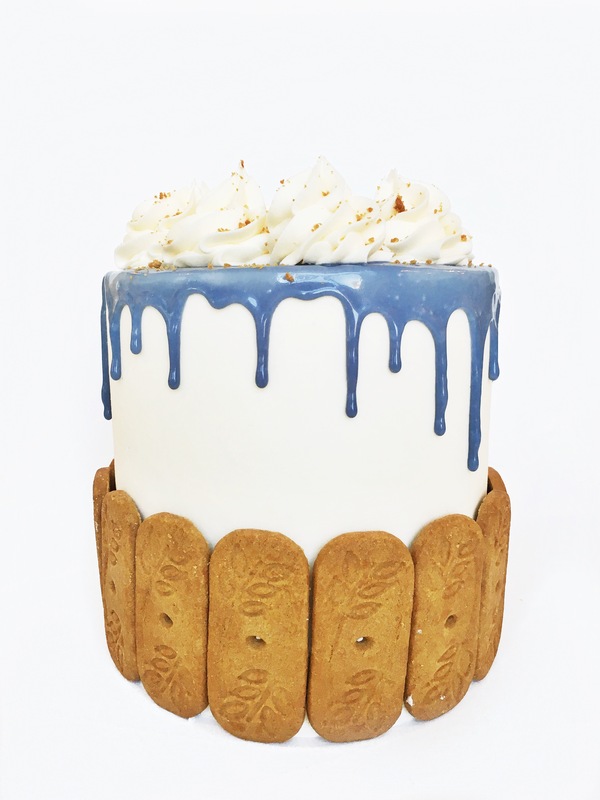 For this cake, you have cinnamon sugar cake layers with a cinnamon sugar swirl, cinnamon buttercream and cinnamon chip ganache. Just remember to only add half of the batter in each pan, then some cinnamon sugar mixture and more batter on top. 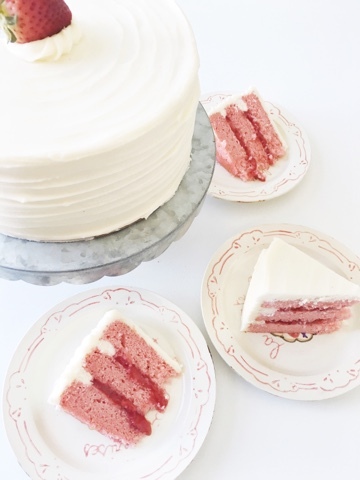 If you’re someone who loves fruit flavored cakes, this Strawberry Cake with Cream Cheese Frosting is a real winner! You can make a strawberry compote filling, use strawberry preserves or just throw in some fresh strawberries between the layers. 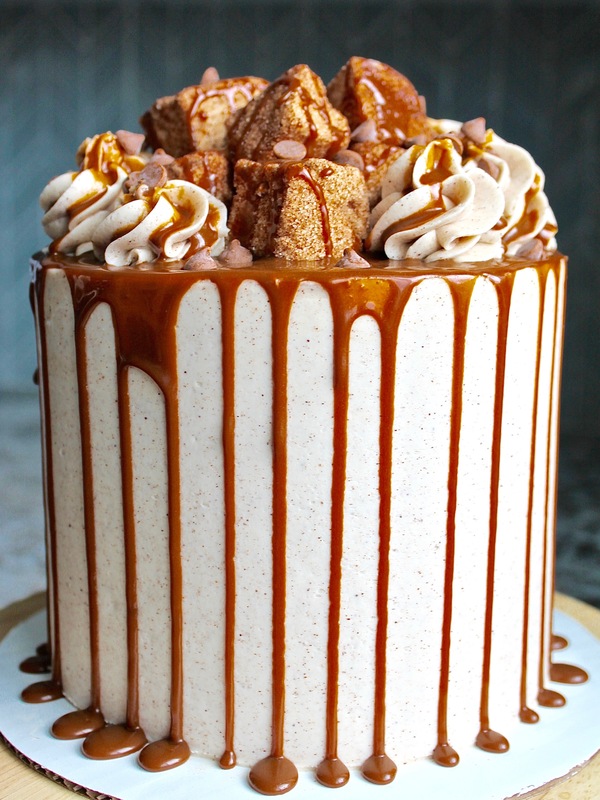 This cake is one of my all-time favorites! 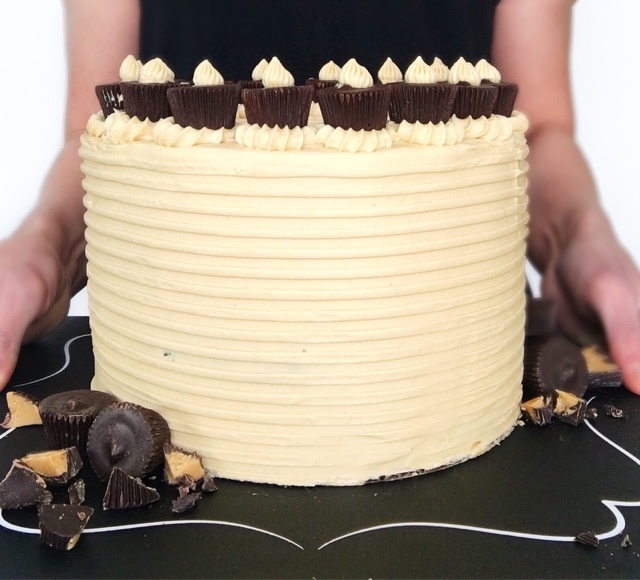 The chocolate cake layers are super easy to whip up and will pair well with any frosting, especially this whipped peanut butter frosting. Hopefully looking at these recipes gives you some confidence to get in the kitchen and start baking. And just remember, the most important part of the whole cake making experience is that you enjoy it! Take your time and spread the baking over the course of a couple days, so you don’t feel rushed. You can make things ahead of time – check out my post on freezing cakes. Then, assemble everything the day of your event. And the next thing to remember as you are just getting started making cakes – don’t worry about how the cake looks, it’s all about how it tastes! Learning to decorate comes with practice. But I have a feeling that once you make your first homemade cake and realize how delicious it is, you’ll find lots of reasons to practice decorating!